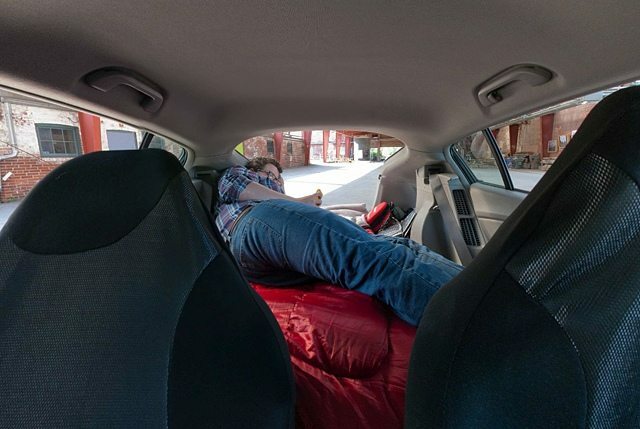 York University film student Tanner Zurkoski has an unusual opportunity to live in a car for 30 days while getting paid for it. Evergreen Brick Works sponsored this month-long endurance test to draw attention to the time most Torontoians spend commuting: on average 82 minutes a day, which adds up to a month out of every year. “After the first week I thought this was horrible,” says Tanner. “But I’m starting to get used to it now.” He spends 23 hours a day in the vehicle. A one-hour break at home base, at the Evergreen Brick Works, is the only out-of-car time he gets. He drives around the city, interviewing people for an online video series he edits in the car, and stopping in various parking lots. He can visit friends, as long as they don’t mind hanging out in a driveway. Evergreen sponsored this project as part of Move, a transportation expo that’s taking place at the Brick Works. The goal is to draw attention to the fact that Toronto has some of the longest commute times in the developed world. Tanner was photographed on day 16 of the month-long project.